Dec. 6, 2013, 2:58 p.m. The Times’ 4th Down Bot, a collaboration with Advanced NFL Stats, analyzes whether your team should punt, kick a field goal, or go for it on fourth down. By Justin Ellis @JustinNXT Dec. 6, 2013, 2:58 p.m. Second-guessing a play call is one of the great joys of being a football fan. Because you know — sitting there on the couch, never having played a single minute of professional football — you just know that you could run an offense made to score points. And yet, lacking the wisdom your keen football mind would provide, your team is facing the reality of an overtime tie with the Packers. Fortunately for you, @SuperFan99, The New York Times, of all people, has your back. Meet the 4th Down Bot. 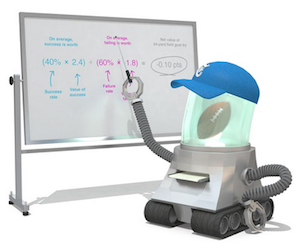 The 4th Down Bot performs realtime analysis of NFL teams’ fourth-down plays and determines if the right call was made. “Right,” in this case, is subjective. Judging by the ball’s location, the distance required for a first down, and the time remaining, the bot examines historical data to figure out whether punting, kicking a field goal, or going for the first down makes the most sense. Here’s a scenario from the Saints/Seahawks game in Week 13: With 2:14 remaining in the first half, the Saints had 4th and 2 on their own 30-yard line. Coach Sean Payton chose to trust the rocket leg of punter Thomas Morstead and kick it away. The Bot disagreed and said he should’ve gone for it. Why? Teams that go for it in that situation win about one percent more often than those who punt. Teams that go for it on fourth down in that position get the first 60 percent of the time, according to the Bot’s data, and possessions are valuable! With about 10 minutes left in the fourth quarter, NYT 4th Down Bot switches from maximizing points to maximizing win percentage. Win percentage measures how often teams who punted, attempted a field goal or went for a first down won the game. The bot will run through the rest of the NFL season, starting weekly with Thursday games (it dinged the Texans for cowardice last night) running through Monday Night Football. At the moment, the system is semi-automated, with a healthy dose of human oversight. Quealy told me they try to verify the down and distance data for plays in order to avoid errors. They don’t want the bot to suggest going for it on 4th and 7 when your team actually gained 20 yards and a first down on the previous play. (That’s easier when there’s only one game on at a time, as there has been since the bot’s debut. Sunday will change that.) When the system is fully automated, it will run analysis and tweet by itself. As for the look of the bot, which progressed from ASCII to 3D, that’s the work of Shan Carter and Jennifer Daniel. Burke’s statistical model supports an idea known in the academic literature for more than a decade: Coaches keep it conservative. They’re far more likely to punt than the model says they should. Burke, who has contributed writing and analysis to the Times’ sports section for several years, said the data backs up many fans’ instinct that coaches are too often wedded to old conventions. Despite the fact that today’s players are bigger and quicker, and today’s playbook is more expansive, coaches keep it simple. “What I think coaches are doing is overthinking the harm that not converting will bring to their team and undervaluing what a successful conversion can bring,” Burke said. Traditionally, Burke’s type of analysis might have been turned into a feature story paired with a set of graphics. That’s usually where someone like Quealy comes in. But Quealy told me they wanted to find a more practical, active use for the analysis. “Something like this seems like a cool idea and something that, like other infographics, we publish and it’s done,” he said. While the output of the 4th Down Bot lives on NYTimes.com, it’s real use could shine through on Twitter, where it can spread quickly along with other social-heavy gameday updates like scores, snark, injury reports, and fantasy updates. Burke said he thinks the bot can catch on because of the intense interest that surrounds the NFL and the abundance of ways to experience games. Having near-instant fourth down analysis fits in well with a world that has become accustomed to NFL RedZone and constantly updated fantasy football stats. Both Burke and Quealy know the bot is bound to cause a fair amount of debate over its calls. In a way, the 4th Down Bot shares rhetorical DNA with sports radio hosts or columnists who delight in second guessing a coach. Of course, the bot’s relying on data while the other two are often relying on their “gut.” Still, Burke said the thing to keep in mind is that the bot’s analysis is not definitive in any way. “The bot and the model are starting points for analysis,” he said. “It’s not meant to be the final arbiter of coaching decisions.” We’ll see if that line of argument holds up when some Times-reading NFL owner starts hearing about how many times his man on the sideline has screwed up. POSTED Dec. 6, 2013, 2:58 p.m.
Ellis, Justin. "Yes, the Vikings should have gone for it on 4th down, and a New York Times robot knows why." Nieman Journalism Lab. Nieman Foundation for Journalism at Harvard, 6 Dec. 2013. Web. 20 Apr. 2019. Ellis, Justin. "Yes, the Vikings should have gone for it on 4th down, and a New York Times robot knows why." Nieman Journalism Lab. Last modified December 6, 2013. Accessed April 20, 2019. https://www.niemanlab.org/2013/12/yes-the-vikings-should-have-gone-for-it-on-4th-down-and-a-new-york-times-robot-knows-why/.